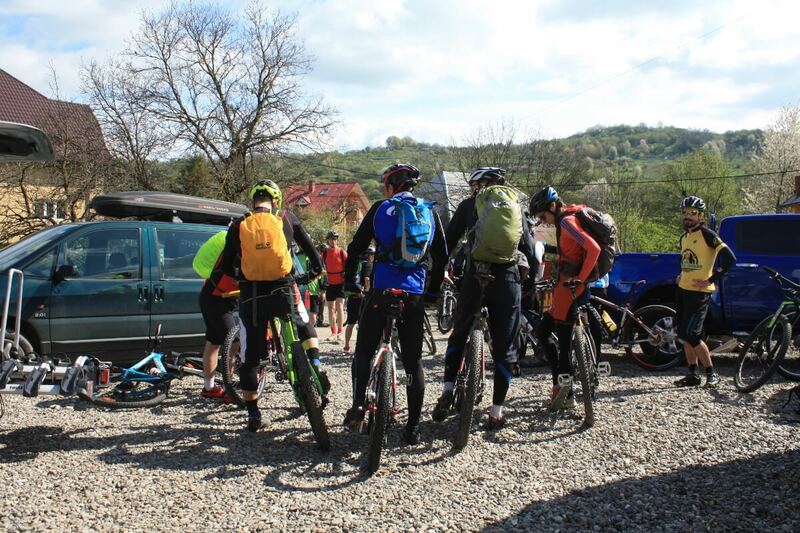 It’s been almost a week by now since the MTB camp organized by The North Quest in Breb, a small village in Maramureș County. 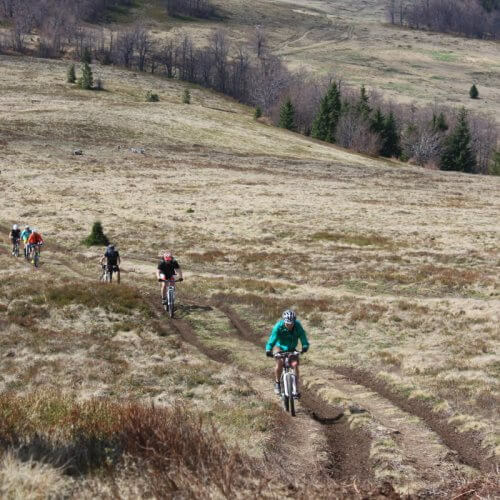 You might be wondering why it took me so long to write about it and why I waited a whole week to do it… Truth is, I’ve been kind of busy pedalling along my friends from the Freerider team, as well as Andy, Aly and a few nice Ukrainians, and I certainly preferred spending time with a glass of brandy (traditional “pălincă”) and some cake baked by Miss Mărioara instead of typing away at my computer. But because it has been getting late and we’re already discussing our next camp, maybe now is the right time to share a bit of my experience, of how my friends saw this camp and, last but not least, of how the participants perceived it… as that’s what matters most to us. 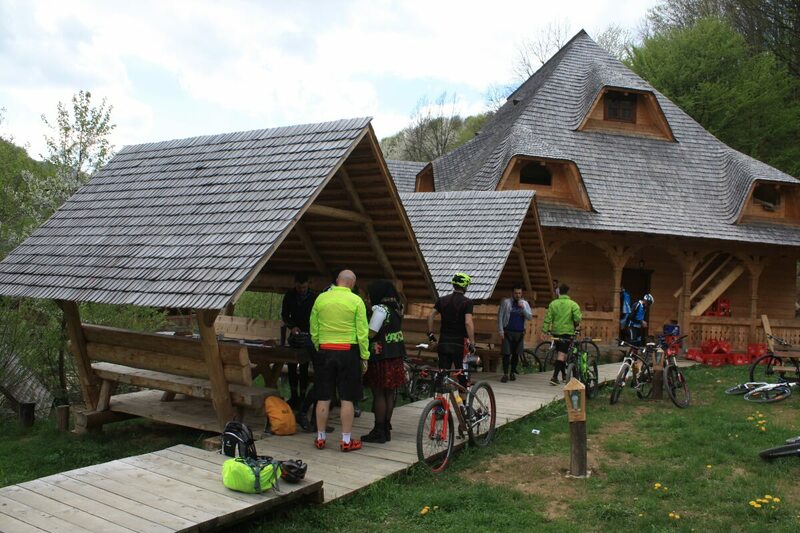 The Village Warrior MTB Camp which took place between April 14th and 17th in the village of Breb, Maramureș County, brought together a large number of participants, about 30 people having signed up for the camp. Because the B&B we had initially booked for the event needed backup, we got a few more rooms at another B&B located really close to the first one, a place we absolutely love. Later we were asked why we hadn’t extended even further the number of places available… But I do believe that a larger number of participants scattered here and there would have ruined some of the general atmosphere and, consequently, of the experience we were trying to create. Furthermore, we were adamant about offering traditional-style accommodation and a traditional-style menu, but at the same time we adjusted these to the needs of the people who, ultimately, were there to work out. In this respect we still have a lot of work to do and we hope to be able to improve our offer in the future. But let’s get back to this year’s edition of the camp. Thursday evening brought us all together for the first time, after most of the participants had driven quite a long way, coming from the southern parts of the country. 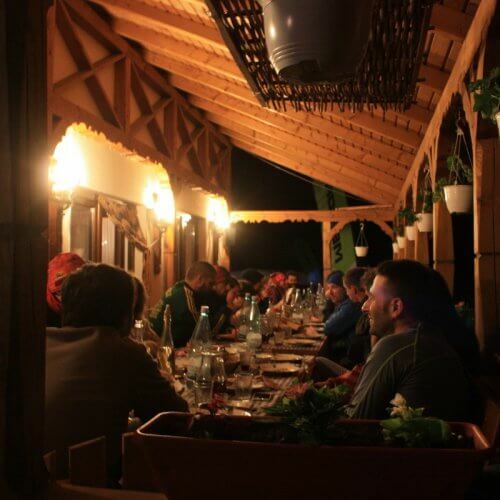 The exhausting drive, coupled with a substantial dinner consisting of potatoes, meat, vegetables, mushrooms in cream sauce, soup, desert and so on, was the reason why most people call it a day quite quickly… though, don’t get me wrong, some of us did stay up late into the night. And because booze rarely ensures a restful sleep anyway, the storm and heavy rain that fell that Thursday night hardly let me sleep. 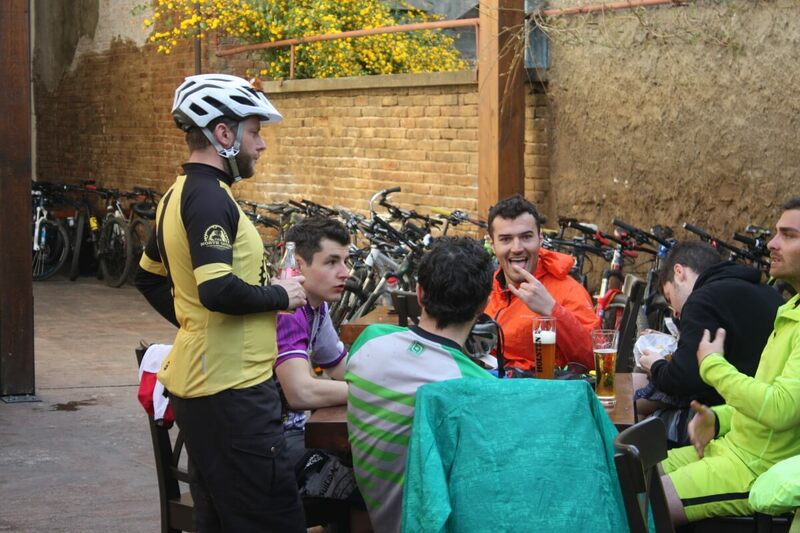 We had a well-thought-out plan, but the route we had chosen for Friday would have been ok to ride on only if the rain had stopped by Thursday morning, which wasn’t the case. 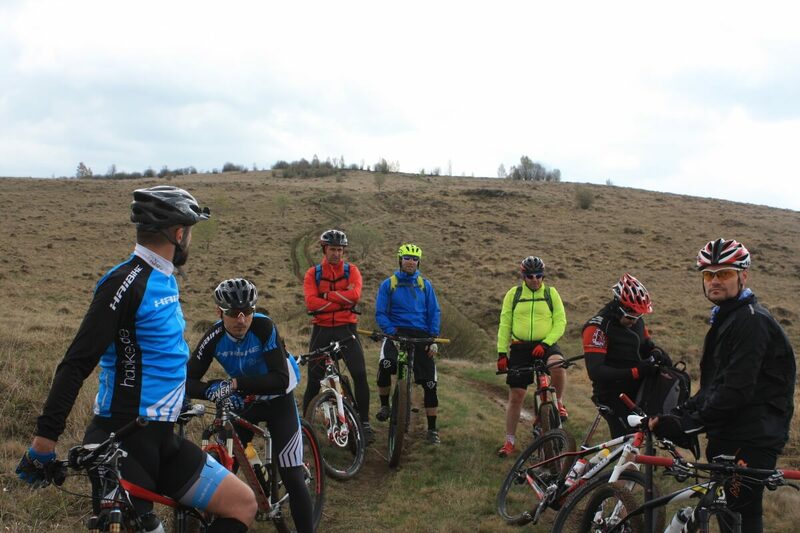 So we were forced to change our plan and ride the route we had initially chosen for Sunday, and even so we still had to adjust it to the weather conditions and take into account the inevitable mud on the nicest sections, which, unfortunately, made them inaccessible at that time. 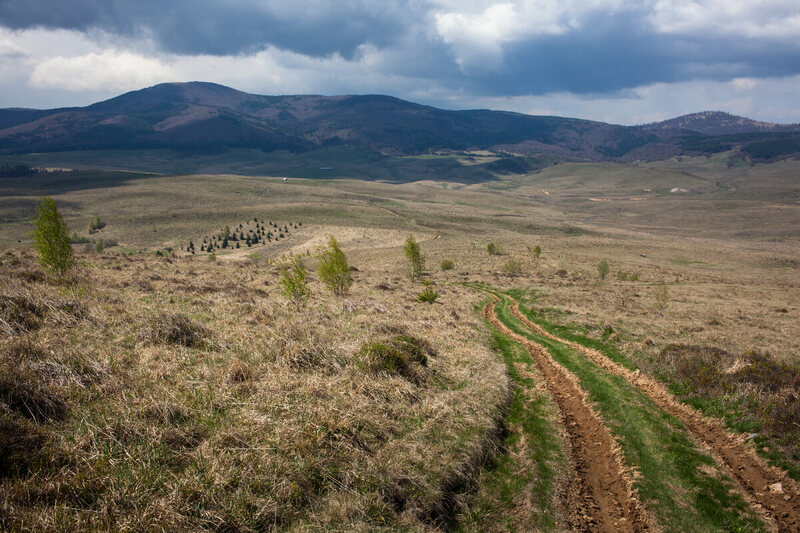 Therefore, Friday morning, one hour after breakfast, we left for Iezerul Mare which, according to experts, is the best preserved peat bog of Maramureș, a flora and fauna reserve located on a wide plateau and providing a particularly spectacular view to the Gutâi Mountains. However, to get there we needed to cross the wall. 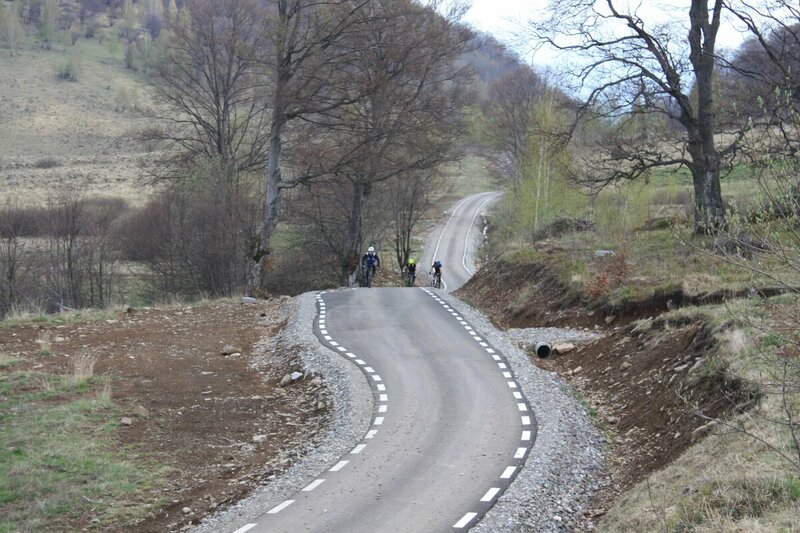 A genuine challenge for many of our group, as the wall consists of an 8 km ascent that amounts to a total vertical climb of 600 m, a road that’s only recently been asphalted and which I used to ride on in the past, when focusing on long training rides. 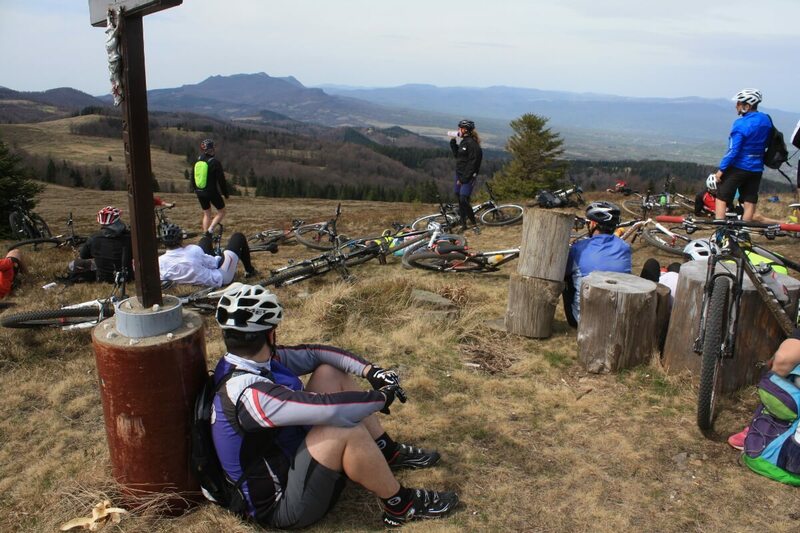 I was the first to reach the top, along with Vlad Urzică, a guy who’s quite impressive whether climbing or descending, and rushed to get a few shots of those who were still torturing themselves with the climb. And I was lucky to catch the faces of some of the participants, some looking rather tired and others not so much, but all of them, apparently, more than delighted by the scenery and the route. Once we had all reached that first checkpoint, we regrouped and began the actual mountain biking section of Friday’s route, with short climbs and longer descents on a dirt road that was surprisingly dry considering how much it had rained the previous day. The end of the descent brought us to the Cheile Tătarului Nature Reserve, 70% of which is expected to become submerged once the construction of the Runcu Dam is completed. However, considering that work at the dam has been frozen since forever, the event that would amount to a miniature apocalypse for the fauna is going to be delayed indefinitely. 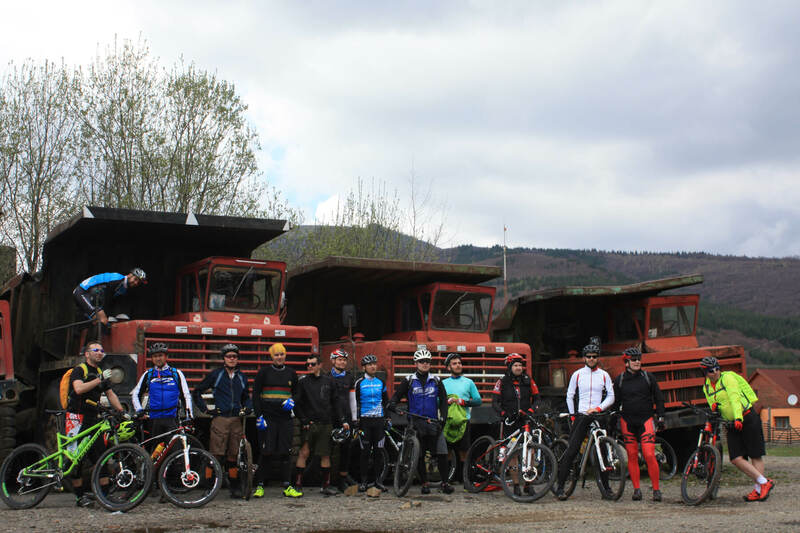 As I found myself leading a group that was used to long hours in the saddle, we deviated slightly from the route and I took them to see some of the equipment and machines used for building the dam, which also kept us from waiting in the cold for the rest of the groups. Everything went well so, a few exceptions aside, we were all able to regroup at a nearby trout farm, where the lady waiting on our table was so enthusiastic that she made quite an impression on all of us… in more than one way. 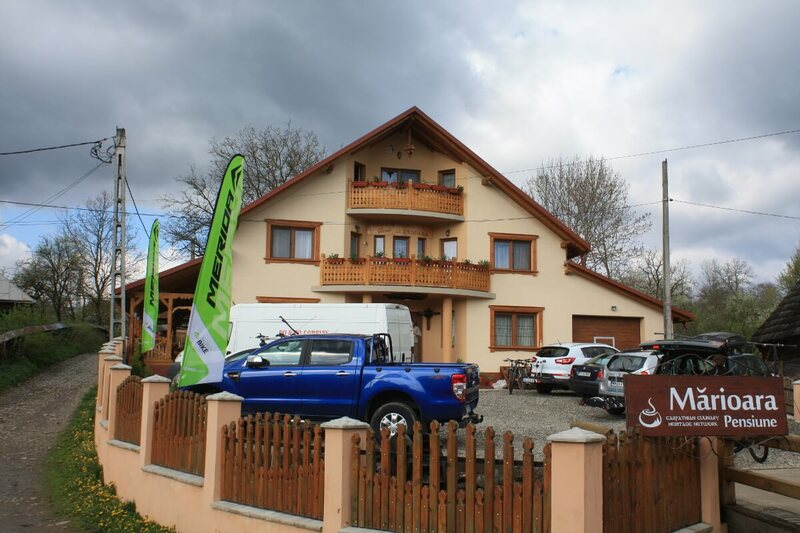 Having quenched our hunger, and then some, we returned to our place of accommodation without pushing ourselves too much, and once there I gave a short presentation on some of the subjects that any passionate mountain biker is interested in. We spent some time talking about basic principles and rules, about approaches, goals and the right way to assess our level and establish realistic standards, which, unfortunately, left little room for what I would have really liked to discuss with the camp participants… all the more so because Miss Mărioara was pressuring us to sit down to dinner. Not looking forward to arouse her wrath, I decided to interrupt the presentation and we all sat down to eat, the sooner, the better. Saturday morning we had planned to leave at 10 am, but loading the bikes in the waiting cars took up slightly longer than we had expected, so it was about 11 when we actually left. Following a 20 minute drive we reached the starting point for the day’s ride, the intersection between DN18 and a so-called county road which was, in fact, a forest road, fair and square. 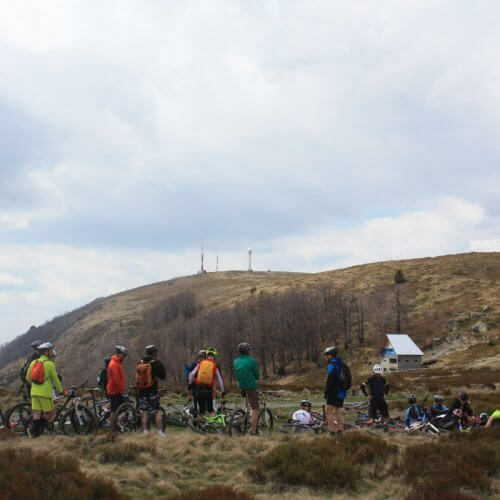 Since we had split the participants into 2 or 3 groups, based on how quickly they had completed the first climb of the day, those who were most eager to ride as much as possible joined me on a somewhat longer route than what had been scheduled for the rest. 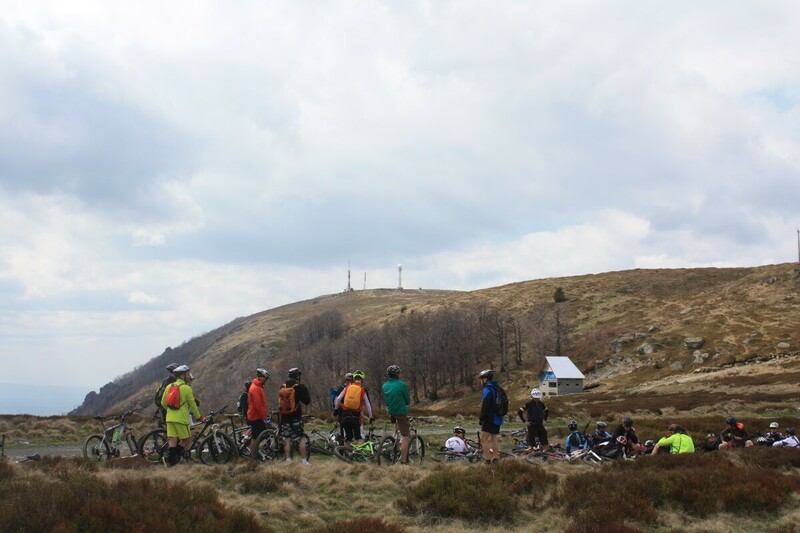 While most of the troupe, led by Sandor and Iulia, climbed towards the Igniș Peak, I took my people to Poiana Boului, and from there we descended on a short but exciting single trail to our next stop, Hanul lui Pintea. Although the people in the back failed to see them, I noticed a small group of 3 wolves quite far from us, running over the field from one forest to the next. It was my first time seeing anything of the kind and it warmed my heart to encounter such wilderness in a land I was so familiar with. Still, let’s go back to the description of the ride. 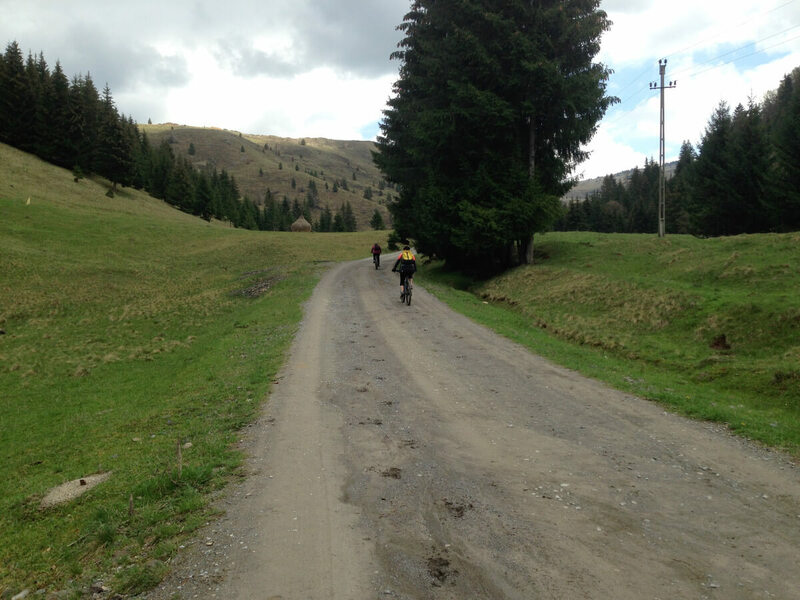 A short descent on an asphalt road took us back to the route the rest of the groups had taken, and we all regrouped again on the Igniș peak. 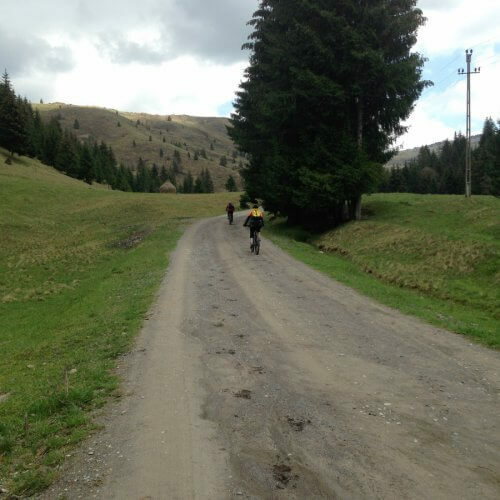 At this point some of us chose to descend on a path called “Motoriștilor”, in fact a trail preferred for motocross activities, which was a quite exciting section as it had its share of segments forcing us to pedal our way through them and several heart-stopping downhill parts that kept us on our toes all the way to the edge of the Firiza Reservoir. 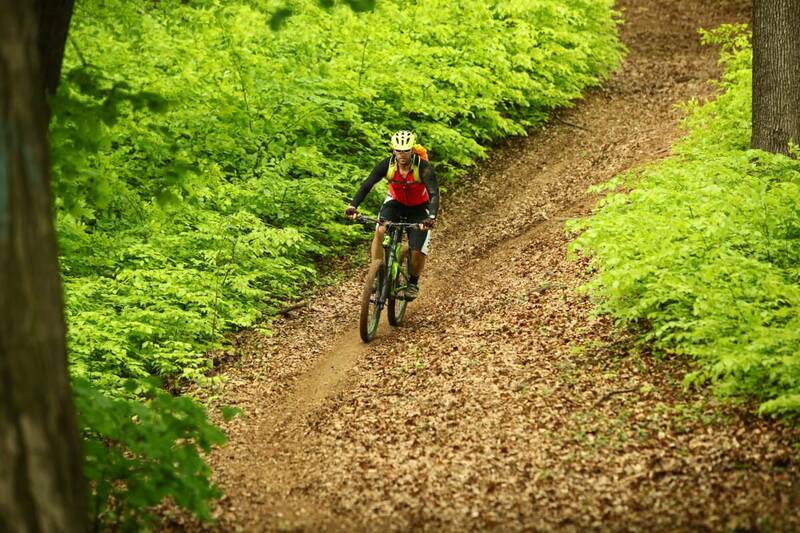 Next came the last climb of the day, towards Șaua Dia, at the end of which we were going to enjoy a nice descent over a rather wide trail with a very pleasant flow, the final destination being the Central Park of Baia Mare city. A quick glass of beer at one of the restaurants in the Old Square proved more than necessary, quenching our thirst and keeping us all satisfied at least until we made it back to Breb. And while we’re on the subject of the return trip, I must express my gratitude to Putyu, who lent us his car. Without his help, I’m certain it would have taken us much longer to load the bikes in the vehicles that had transported us from Breb. 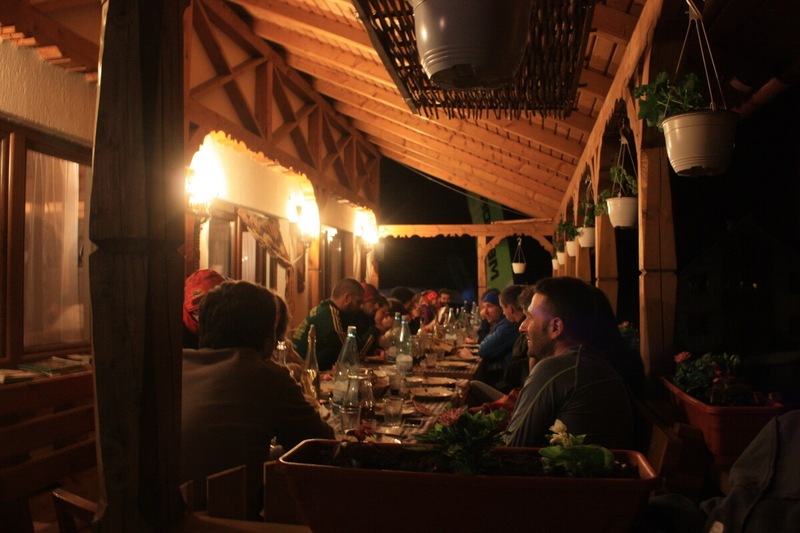 Back in the village we were welcomed by Miss Mărioara, who was already waiting with an impressive dinner made of local treats cooked over a grill. The evening was capped off by music and stories about the experiences of the day. Because of how we had rescheduled the rides, Sunday’s route turned out to be slightly too difficult after the previous two days spent in the saddle. We climbed and climbed and then climbed some more, for about 10 km, until we reached a sub-alpine plain with an elevation of over 1300 m. Most of us enjoyed the climb and we were all rewarded in the end with an unparalleled 360 degrees view to the surrounding area, as well as to the mountain summits north-east of us. 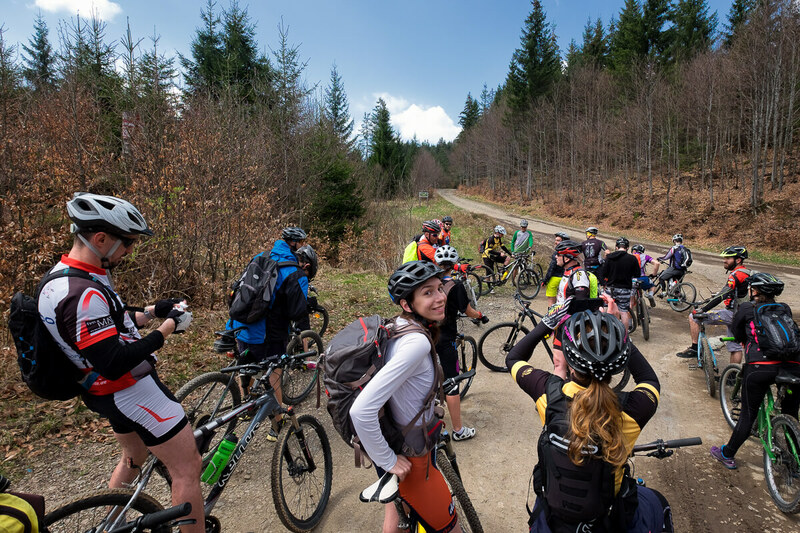 Because some of the participants were in a rush to get home, we split into two groups: some of us completed the initially planned ride, whereas others went back to Breb so they could get ready to leave. 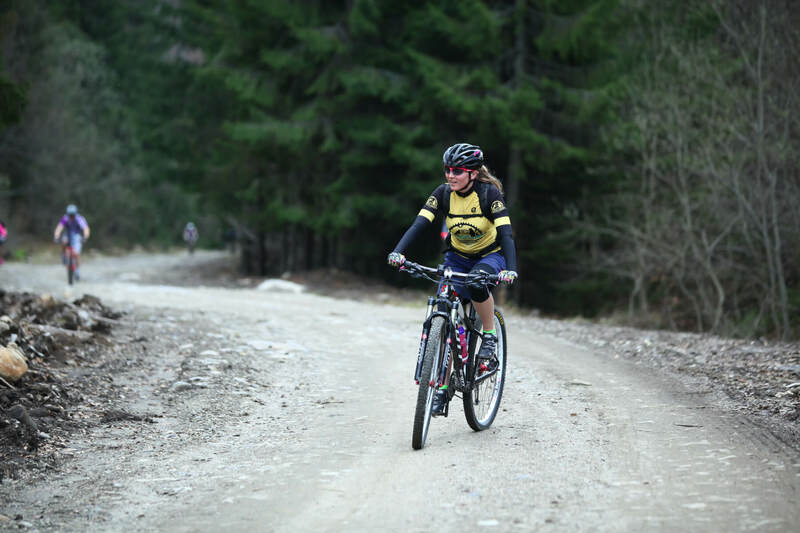 The longer version of the ride ended up being quite challenging in terms of technical skills required, but I did hope that the scenery and the pleasant trails we got to ride on from time to time more than made up for the strain. 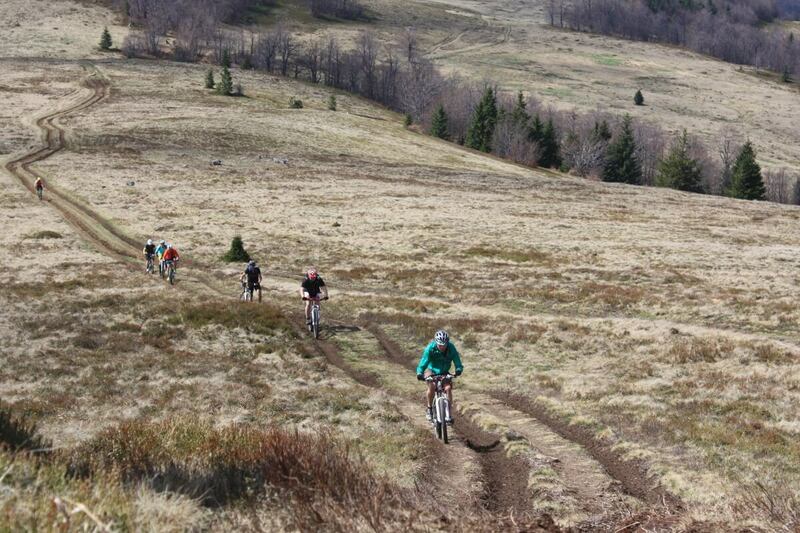 One long descent followed by a short climb on an asphalt road marked the end of the Breb mountain bike camp. 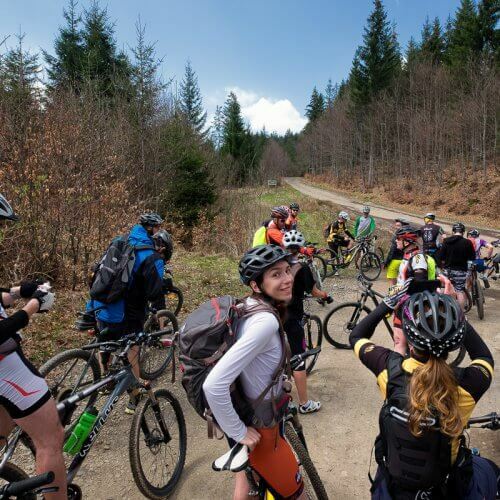 As far as we’re concerned, we’d love to live this kind of experience again, as often as possible and in locations that would provide as much variety as possible, to attract people who share our passion and to enjoy together everything that nature has to offer, all the pleasures of mountain biking and the incredible feelings of freedom and satisfaction that are within reach for any mountain bike fan. And the conclusion? I think there’s more than one, but because it’s difficult to put thoughts into words, it’s better to simply say this: the participants were all delighted by the beauty of that place, by the routes we had planned and the services we had provided, and we sincerely believe and hope that the Breb experience was something truly special for everyone involved. In the future we’ll strive to further improve the experiences offered through The North Quest and we already have a long list of ideas, which we’re never short of, that are neatly written down on a sheet of paper to my left. 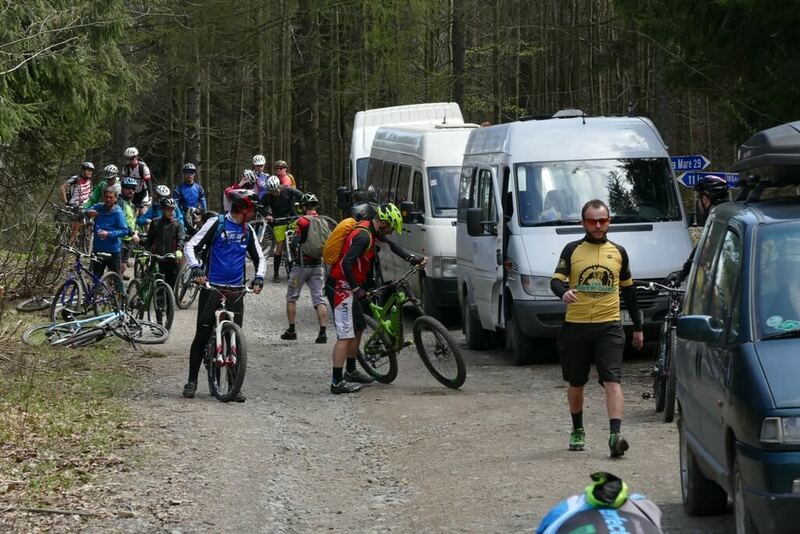 We’ll meet you again at the MTB camp organised in May in the Rodna Mountains, where our focus will be on definitely more challenging routes, the kind that test your endurance, but also reward your efforts with incredible scenery and unforgettable experiences! Follow The North Quest Facebook page, as we will soon post the exact dates and more detailed information about this next camp! 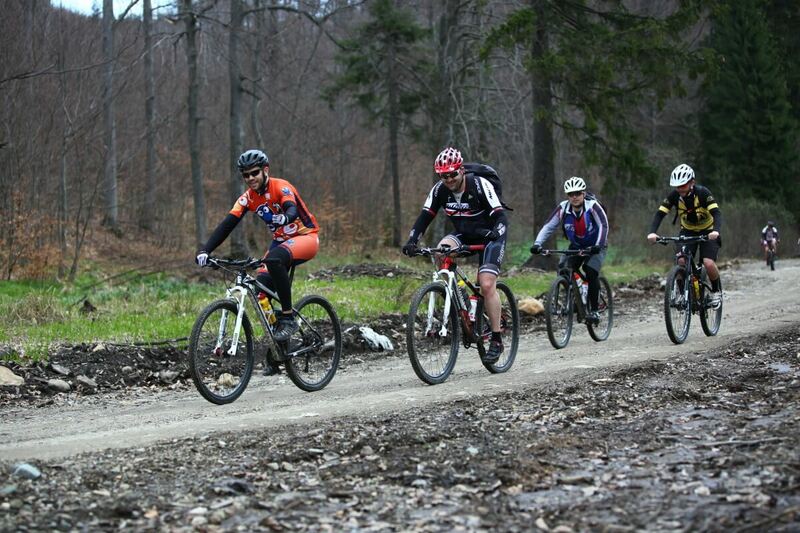 Until then, feel free to browse some pictures, as they’ll most likely do a better job than me at describing the overall atmosphere of the Village Warrior MTB Camp. See you soon! Photo credits: Robert Dobai (for those less than stellar shots) and Emil Pop (for those truly awesome pictures).